"I grew up in a foodie family. My dad's a restaurant guy, and my mom currently makes wine in Napa. That's partly why I wanted to come here today, because I'm always eating tasty food and like to find new spots," confesses L.A. artist Robert Fleming, who creates music under the name Victory, as we meet in front of the city's oldest and largest public marketplace, Grand Central Market. Occupying the ground floor of the Homer Laughlin Building since 1917, the Downtown landmark is an indoor bazaar that provides fresh produce, Mexican chiles, Chinese medicines and a plethora of food options to tourists and local shoppers alike. The ever-evolving list of stalls offer everything a well-cultivated palate such as Robert's could hope to experience all under one roof. Whether you're in the mood for lengua tacos from Tacos Tumbras a Tomas, a pork cutlet from Bento Ya or a popsicle from the Sweet Clementine's cart, there's something to satisfy all appetites. Robert and I grab a table in front of one of Grand Central Market's recent additions, Horse Thief BBQ, to sit in the shade and talk about life in Los Angeles, his Victory Is Music debut full-length and, of course, food. He informs me that GCM's owners are bringing in more artisanal purveyors like Horse Thief to breathe new life to their vendor list. 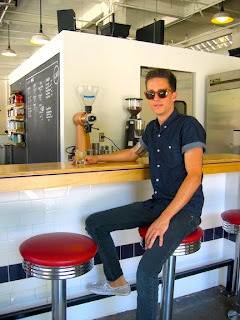 I order a refreshing Arnold Palmer from the Texas-style barbecue joint while Robert opts for his usual from one of his favorite stalls, G&B Coffee, the brainchild of Kyle Glanville and Charles Babinski, who met while working together at Intelligentsia. Victory is coffee addiction - at G&B. "My studio is Downtown, so I come here a lot, especially for coffee. I'm a coffee nut. G&B just opened [in June]. They were at Sqirl in Silver Lake, and then they started Go Get Em Tiger in Larchmont and this location. They have really good coffee," he says. "I get what's called a Gibraltar or cortado. It's a San Francisco concoction: espresso with steamed milk, less milk than a cappuccino and no foam. It's like a latte but with way less milk." Although Robert grew up in Phoenix, Ariz., he spent some time in San Francisco where he cultivated an addiction to Gibraltars, as well as the habit of walking around the city, something he has continued to do over the past six years here in Los Angeles. "I spend my free time eating and romping around town. Day drinking is very fun from time to time," he laughs. "Coming to places like Grand Central Market and exploring, finding out about new restaurants and places – that really is fun for me." 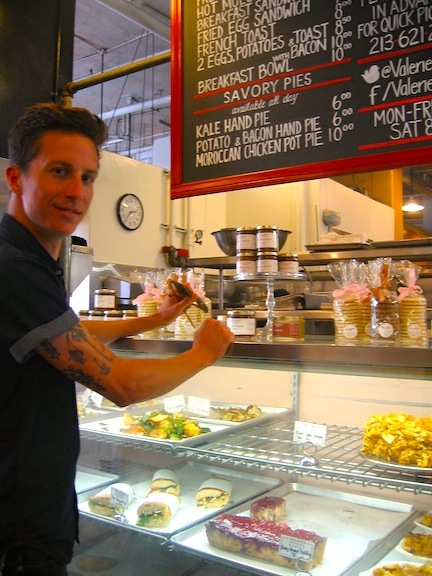 As a Silver Lake resident, some of his favorite neighborhood haunts are Covell, a wine bar in Los Feliz, Bar Stella at Sunset Junction and L&E Oyster Bar on Silver Lake Boulevard. He is also a fan of the Monday-night residencies at the Echo, the Satellite, Silverlake Lounge and Bootleg Bar." When I notice a black tattoo on his right arm, Robert explains its design. "It's the different parts of a palm tree, because I love palm trees. I didn't even know what that was [pointing at one of the parts drawn on his arm], then I looked at botanical prints, and now I'll see them around Los Angeles," he tells. "It was done at Incognito in Los Feliz." Aside from the palm trees, Robert has come to love Los Angeles for all the reasons that most people come up with ("the weather, the good vibes"), but mainly, he likes his fellow Angelenos. "The people seem so friendly, which sounds funny because you wouldn't imagine that, but people are really accepting. Everyone's so creative, doing cool things and pursuing what they love, which is so inspiring as opposed to growing up in a town where people fall into the trap of doing what they're supposed to do, what they should be doing, like getting a corporate job they don't enjoy. Here, you're around people who are pushing you to do what you like." Music has always been Robert's passion. At age 11, he got his first guitar and occasionally took lessons or picked through songs using tabs in Guitar World magazine. Then he met his soul mate, a four-track cassette recorder. "I got was a multitrack cassette recorder when I was in seventh or eighth grade, which, to me, was an instrument in itself because you could layer things. You can record one track – whether it's guitar, some hand claps or a little beat – then you can rewind and hear it while you play something else over it, and that's two tracks. Then, you do it again and again. You're making sounds out of nothing, as opposed to, I've never been a 'sit down and write a song on guitar guy' as much. It's always been with that studio tool, whether it was when I was a kid with a tape recorder or now in my studio with a computer." Robert thought he would grow up to be a lead guitar player, not a singer or even a songwriter. But one album changed everything for him. "When I first moved to San Francisco I heard a record by Spoon, Kill the Moonlight, and thought, 'This is an amazing record, but I feel like I could do that.' It made it more approachable because I wasn't listening to Hendrix or Led Zeppelin; there weren't a lot of guitar solos, he [Britt Daniel] doesn't sing using an incredibly huge range like Otis Redding or Al Green. Obviously I could never make that record because it's so fantastic, but it made it more within my reach," he recalls. "I've seen Spoon perform way too many times. I had to consciously stop listening to them just because people have said that they thought my voice or my music sounds like their stuff. I like it so much that I can't help but want to play like it, so I just can't listen to it anymore. " After finishing our drinks, we start walking through the market. We pass stalls loaded with fruits and vegetables as we make our way to another of GCM's vendors that Robert frequently visits, Sticky Rice. He points out that the Thai street-food booth only uses free-range and organic ingredients to prepare its menu items, like the Gai Yang (barbecue chicken) and Khao Mon Gai (Thai Hainan Chicken), which he recommends as a must-try dish. 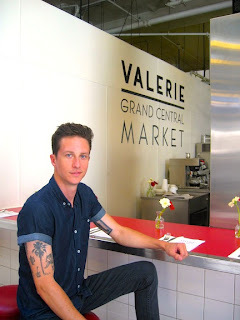 The list of must-try's gets even longer when we end up at one of his favorite vendors, Valerie at GCM. An offshoot of Valerie Confections, the GCM location serves all the scrumptious desserts and pastries the bakery has become known for in addition to sandwiches and salads. Robert often stops at the stall on the way to his studio for a breakfast sandwich with ham that he's dubbed 'The Allison' in honor of the server who usually prepares it for him. Victory is sweet – at Valerie at GCM. After his Kill the Moonlight epiphany, Robert began focusing on his songwriting. But the path to Victory wasn't a quick and easy one. "I was very lazy and a procrastinator for the better part of my musical career. I had always been a studio musician and had a hard time finishing stuff. I was scatterbrained with a bunch of ideas, snippets of songs, but never finished anything. When I was approaching 27, the age when all my idols died – Hendrix, Janis Joplin, Jim Morrison (the 27 Club) – I was like, 'I haven't put anything out. I haven't finished anything. I'm useless.' I had to finish something and that was what became my Demonstrations EP," he says. "I called it Victory because I finally did it. I also wanted something really positive because music's so fun. It should be upbeat and happy – that's ideal for me." So in 2011, he launched Victory with a seven-song EP, Demonstrations, that he created in his bedroom. He started to play at venues around town, building a following with his unique brand of rock 'n' roll that blends electronic bleeps and piercing guitars with the cheer of 1960s pop and Robert's own cheeky playfulness. He released a full-length in April, Victory Is Music, that he wrote and recorded from scratch in his bedroom and Downtown studio, with Joey Waronker (Beck, Elliott Smith, Lisa Germano) contributing drum tracks for six of the songs and Grammy-winning producer Chris Testa (Neko Case, Paul Simon, Jimmy Eat World) assuming mixer duties. Whether you're listening to the infectious single "This, That or This," acoustic "Dirty Jeans" or buzzing "Play It" (which appears in a Cadillac XTS commercial), Victory Is Music is guaranteed to become your new addiction with just one listen. The songs either include hand claps or induce them, encourage dancing alone in your bedroom or with someone who catches your eye in the bar, and mainly just make you smile. "Music should be fun. People get into it for different reasons, but music, to me, has always been so fun. I hate it when people are so pretentious about it," he says. "That's not to say that I don't take my craft seriously, but overall, everything – life, people – is so funny. We should all just be laughing and dancing." Victory Is Music is currently available. Victory performs Sept. 21 at the Chinatown Moon Festival, Sept. 29 at Abbot Kinney Festival and Oct. 5 at the Mint. For more information, visit victoryismusic.com.